More than $1.5bn (£950m) has been pledged to help civilians affected by the conflict in Syria at a conference of international donors, the UN says. King Abdullah of Jordan, which is hosting 224,000 refugees, warned its resources were "exhausted", adding: "We have reached the end of the line." UN Secretary General Ban Ki-moon meanwhile appealed to all sides to stop fighting "in the name of humanity". As he spoke, Syrian state media blamed a rebel group for a massacre in Aleppo. The bodies of more than 70 men and teenaged boys were found on Tuesday on the banks of the River Quwaiq in the second city's rebel-held western district of Bustan al-Qasr. In a separate development, Israeli forces attacked a target on the Syrian-Lebanese border overnight, security sources said. Sources told the AFP news agency that the Israeli air force had bombed a weapons convoy. However, it was unclear if the attack had taken place on Syrian or Lebanese territory. The Israeli military has declined to comment. Meanwhile, the head of the main opposition alliance, the National Coalition, announced on Facebook he was "ready for direct discussions with representatives of the Syrian regime in Cairo, Tunis or Istanbul". Moaz al-Khatib set out two conditions - the release of the 160,000 people he said were being held in Syrian prisons and intelligence facilities, and the resumption of the issuing of new passports by Syrian embassies. This is good news for a relief effort which has so far been hampered by being severely under-funded. While the US, Europe and others have increased their own donations, what made the difference was a change of heart by some of the rich Arab states of the Gulf. Saudi Arabia, the UAE and Kuwait each promised $300m. In the past, the Gulf states have been reluctant to put funds through the UN, partly because it works largely through Damascus. The UN insists, though, that it does not give money directly to the Syrian government, and it is also looking at other ways of getting aid to rebel-held areas. While the big new pledges will be extremely welcome, in the past performance has not always lived up to promises. This is also just what is needed for the next six months, and the challenge is growing bigger every day. Addressing the International Humanitarian Pledging Conference for Syria in Kuwait City on Wednesday, Ban Ki-moon described the situation in Syria as "catastrophic". "I appeal to all sides, and particularly the Syrian government, to stop the killing... in the name of humanity, stop the killing, stop the violence," the UN chief said. He also called for urgent financial aid to ease the suffering of civilians, warning that if funds were not forthcoming "more Syrians will die". In December, the UN set a funding target of $1.5bn, which it said was needed to provide food, shelter and other aid over the next six months to four million people inside Syria and 700,000 others who have fled abroad. Kuwait's emir opened the conference by calling for humanitarian efforts in Syria to be redoubled and announcing a donation of $300m. Sheikh Sabah al-Ahmad al-Sabah said the "horrifying reports" of violence were a "cause for concern over the security of Syria [and] its future". The $300m pledge was matched by the United Arab Emirates, which was represented by Abu Dhabi's Crown Prince, Sheikh Mohammed bin Zayed al-Nuhayyan, and Saudi Arabia, which sent its Finance Minister, Ibrahim al-Asaf. UK International Development Secretary Justine Greening pledged £50m, Bahrain's Crown Prince Salman bin Hamad al-Khalifa $20m, and the German foreign ministry 10m euros ($13.5m; £8.5m). A Kuwaiti-led NGO coalition also pledged $183m. At the end of the conference, the UN secretary general announced that the $1.5bn target had been exceeded. 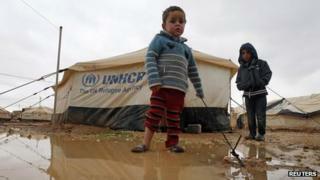 The UN refugee agency's chief spokeswoman, Melissa Fleming, said it was the largest total raised at such a meeting. Earlier, UN Under-Secretary General for Humanitarian Affairs Valerie Amos had told delegates that the winter weather had made matters worse for Syrian refugees and internally displaced people, with many struggling without suitable clothes, blankets or fuel. "We are watching a human tragedy unfold before our eyes," she added. On Tuesday evening, the medical charity Medecins Sans Frontieres (MSF) said international aid was not being distributed equally within Syria, with government-controlled areas receiving nearly all of it. "The current aid system is unable to address the worsening living conditions facing people inside Syria," MSF president Dr Marie-Pierre Allie said in a statement. MSF said rebels controlled areas where at least a third of the country's population - about seven million people - were currently living. The UN said 49% of the food aid it was distributing to 1.5 million people in co-operation with the Syrian Arab Red Crescent and other aid agencies was delivered either to rebel-held or contested areas. Also on Tuesday, the UN special envoy for Syria, Lakhdar Brahimi, told the Security Council in New York that the conflict had reached "unprecedented levels of horror". Media captionThe BBC's Jim Muir: "I counted on just one video about 48 bodies"
His comments came after the discovery of dozens of bodies in Aleppo. Most of the dead had their hands tied behind their backs and gunshots wounds to their heads, suggesting they were executed summarily. On Wednesday, the state news agency Sana reported that the families of the victims had "identified a number of the killed, stressing that the al-Nusra Front abducted them because of their refusal to co-operate". Sana's reporter said the water level in the river was too low to carry the bodies any distance suggesting they had been killed in Bustan al-Qasr. However, locals said several of those killed were from rebel-held districts and had disappeared after crossing into those under government control. Some had been detained by security forces, they added. The National Coalition blamed the government and called for an international investigation. It warned that "ongoing global inaction towards human rights violations encourages the killers to continue their crimes".